October 26, 1986 was one of the most dramatic days in the history of the world championship. The season had built up to a point and three drivers stared each other down for a battle for the title. All through the year the Williams drivers, Brazilian dual world champion Nelson Piquet and late blooming front running Brit Nigel Mansell, had staged a spectacular battle. But reigning champion, McLaren's Alain Prost, had been quietly accumulating points and the three of them were in with a shot at the title. It was the second Australian Grand Prix, the few glitches in the new race's armour gone and everyone was looking forward to the last race of the year. Right from the word Go it was winner take all, as Piquet and Mansell fought over qualifying. Mansell took pole from his teammate ahead of Ayrton Senna (Lotus), Prost, Rene Arnoux (Ligier), Gerhard Berger (Benetton) and Keke Rosberg, having his last race in the McLaren. Mansell won the start from Senna, but would settle down into the third (fourth would do) he needed to be world champion, allowing the Brazilians to run away. Piquet, however, was soon in trouble with his fuel consumption and there was no way he could hold back... Rosberg! The Finn was determined to remind everyone that despite a wretched year, he was a world champion and loved the street circuits. Senna faded slowly with a sick engine, Michele Alboreto (Ferrari) was out with damage from an incident with Arnoux, and local hero Alan Jones, like Rosberg also retiring and also showing the mettle that made him world champion, dragged his Lola-Ford up to eighth in the first 15 laps before the inevitable engine failure. 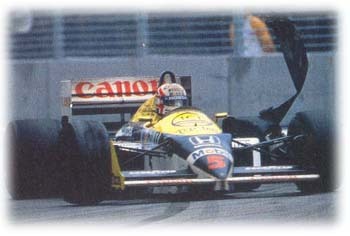 Prost moved past Mansell into third and pressured Piquet into a spin on lap 23. Prost collected a puncture and dived in for an early pit stop. There was speculation that the cars would run non-stop. At this point the race appeared to settle. Goodyear were happy with the tyres that had come off Prost's car while Rosberg now had a big lead over the Williams duo, Piquet taking second approximately mid-distance. 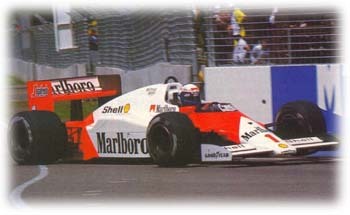 By lap 60, Prost had regained the lost time to the Williamses but Mansell had the championship under control. But without the slightest warning the race suddenly changed, leaving one of the challengers shattered and yet relieved, another disappointed, and the third utterly jubilant. On lap 63 Rosberg was parked against the wall with a failed rear tyre. While the commentators made the right noises about the end of a great career, the Goodyear technicians didn't like what they saw. They liked even less the tyres that simultaneously came off Thierry Boutsen's Arrows during a pitstop. The order went out - bring them in. The order was given within the same lap but for Nigel Mansell it was too late; coming down Brabham Straight at full noise Mansell's left rear tyre spectacularly delaminated. The car sat down on the deflated corner and Mansell struggled to control the car at the fastest part of the track surrounded by concrete. In a shower of sparks and flailing rubber, Mansell somehow kept the car travelling straight and pulled the car up with a gentle nudge into the wall at Racetrack Hairpin. The Brit was philosophical - he wasn't a world champion, but he was alive. 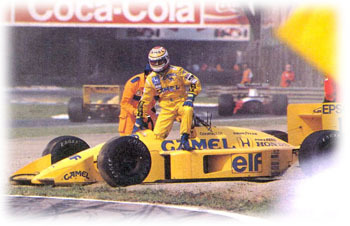 Piquet made the pitstop, which Prost didn't need after his earlier stop. Unbelievingly the Williams duo had lost and Prost has won. Prost never completed the cool down lap, waving his arms madly, then leaping from the car. The underdog had gotten up, for a race in Australia a somewhat fitting end. On August 14, 1988, Formula One mourned the passing of the sport's biggest name - Enzo Ferrari, who died at the age of 90. His name will forever be associated with Formula One, and indeed with Motor Racing in general. Within five weeks of his death Formula One gathered itself at the 'cathedral' of motorsport and the spiritual home of Ferrari - Monza. It had been a great year, if you drove a McLaren-Honda. With the banning of turbos coming into force the following year, and Renault having pulled out of Formula One the previous year, several teams switched to the new 3.5 litre naturally aspirated rules early, including Williams and Benetton. However, the turbo cars had enough power to still be convincingly better than the non-turbo cars. McLaren's only real opposition was Ferrari. Lotus-Honda were disappointing, especially Nelson Piquet, and the only other turbo team of any note was Arrows who picked up the occasional points finish using the Megatron, the brutally powerful motor formerly known as BMW. In the previous seven races Ayrton Senna had won four times and Alain Prost three, with the duo sharing five second places as well. Only Ferrari's blossoming Gerhard Berger and veteran Michele Alboreto, Lotus' Nelson Piquet and Benetton's Thierry Boutsen had stood on the podium at any other time. And Monza looked like more of the same. Ferrari had done a lot of homework on the car prior to Monza, and the cars appeared with revised turbos and exhausts. Suddenly the huge Honda fuel economy gap had been reduced. And at Monza there isn't much in the way of fast corners for the aerodynamically better McLaren to exploit. The McLarens however still qualified first and second. Ferrari were third and fourth. The rest followed. Prost won the start but Senna led into the Rettifilo, with Berger and Alboreto following. Senna was running away, but Prost was not. The Ferraris kept the Frenchman in sight. Honda engineers were worried. Satoru Nakajima had an engine failure in the second Lotus, and soon after the reason for Prost's lack of speed became obvious when he cruised in with a blown motor. The Honda engineers quickly re-mapped the engine settings for Senna. With Senna running more conservatively Berger came back into the picture. Michele Alboreto was the fastest man on the track, setting the fastest lap of the race along the way and he too was catching the McLaren. Senna had a gap on the Ferraris good enough to probably ensure the win. But only probably. When Senna came up to lap Jean-Louis Schlesser, a man who would later become a dual World Sportscar Champion, in the Williams-Judd (subbing for the ill Nigel Mansell) he didn't have time to waste getting past. Schlesser locked-up his tyres on the entry to the Rettifilo. Senna, seeing the Williams wide to the right, well off line, went for the move. Schlesser made the first corner though and was on the apex of the second when Senna arrived at the same point. The two touched and Senna spun across the next kerb and was beached with rear wheels in the air. The two scarlet cars blasted past and the crowd took up the refrain as they realised the McLaren wasn't coming around. It was almost as if Enzo himself had intervened. 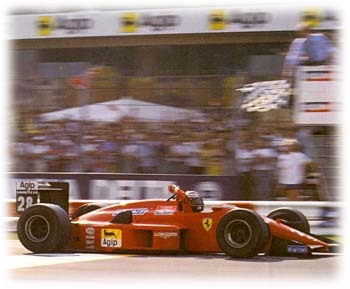 For the final two laps the Ferraris gloried in the adulation, as Gerhard Berger and Michele Alboreto took a 1-2 finish to a crowd reception to rival any Nigel Mansell Silverstone win. The old man would have been smiling smugly from a distance. Mark Alan Jones © 1999 Kaizar.Com, Incorporated.